The Space Shuttle Columbia was the first operational Space Shuttle in NASA's orbital fleet. This space shuttle flew 28 missions with a total 160 crew members from April 12, 1981 until her in-flight destruction on January 16, 2003. Built at the Rockwell International assembly in Palmdale, California, the Columbia was constructed within only four years – from March 27, 1975 to March 8, 1979. Columbia's orbiter paint scheme was unique. And until its final refit, Space Shuttle Columbia was the only operational orbiter with port wing marked with the American flag, and starboard wing marked with the letters ""USA"". Columbia was also the only orbiter launched with its external tank painted white—later the paint was discontinued to save weight. Columbia never made it home safely; 400,000 feet over the Western Pacific Ocean, on February 1, 2003, Space Shuttle Columbia’s Orbiter entered the Earth’s atmosphere and began its gradual and declining trajectory to land at Kennedy Space Center. The Crew and Orbiter were already doomed—a fractured chunk of thermal protective foam damaged the left wing on lift-off. Columbia crossed the California coast traveling 17,103 miles per hour. At 219,000 feet over Nevada, a forward wing sensor picked up the first elevated heat readings; witnesses in Dallas observed flashes, trails, and streaming debris. Shuttle Columbia disintegrated in the clear skies over Texas. Unforgettable in every way, the Columbia Orbiter wood model recalls the valor of her unconquerable crew. 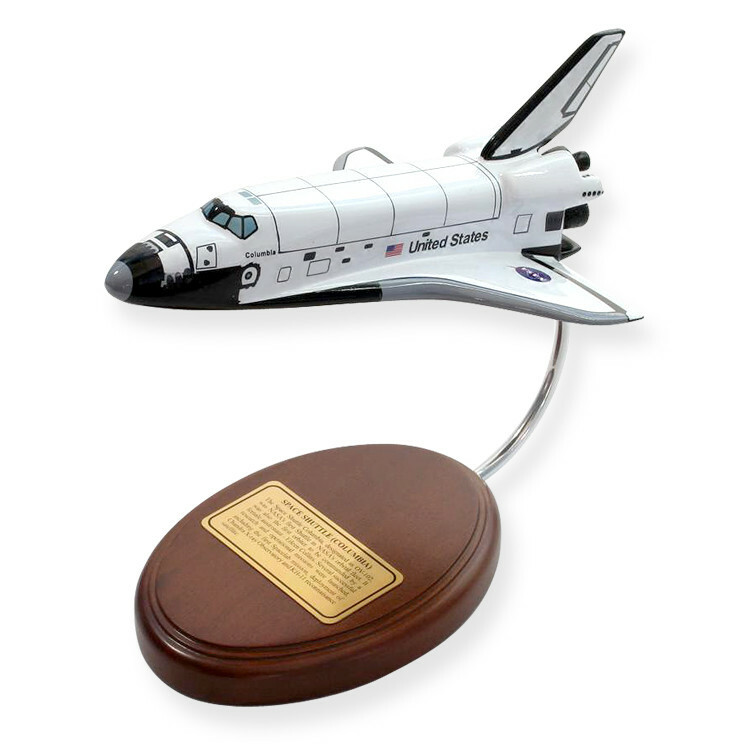 Hand crafted using highest quality materials, this space shuttle model was faithfully finished to reproduce the original spacecraft. Columbia’s Orbiter is represented in her final and infinite mission in this desktop display. Make her a special place of honor in your timeless collection.